We are very excited to announce our embarking on our first theatrical feature project, Tall Tales – From the Magical Garden of Antoon Krings. This provides us with the great opportunity to team up once again with Aton Soumache and his talented crew at ON and Method, with whom we previously partnered in adapting several cultural icons into series: The Little Prince, Playmobil Super 4, Robin Hood, Chaplin, and Iron Man. TALL TALES – From the Magical Garden of Antoon Krings relates the adventures of garden creatures. With over 20 million book sales in the past 10 years, Tall Tales has become, by far, the #1 French children’s publishing property. Beyond the sales success, however, what really fascinated all of us is the unique positioning of Tall Tales within the publishing landscape. The franchise’s appeal resides in its sophisticated aesthetic, bringing to life animal characters with heart, who reside in a magical world full of adventure, innocence, and fun. It is no surprise that Kring’s work connects so strongly with both children and their parents. And now this fascinating world is coming to life in a big-screen animated feature, and much more. 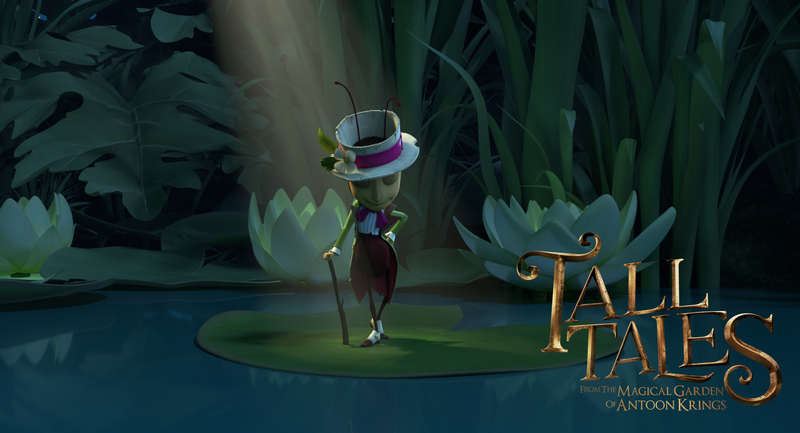 With TALL TALES, ON took on one of the most ambitious projects in the studio’s history. It took six years of graphic development, including three years of research simply to develop the techniques necessary to do justice to Kring’s vision. TALL TALES will be much more than a movie. Here was one of the very first animation hurdles. The arrival shot enabled the team to test and develop the lighting so peculiar in a garden, with the sun’s rays creating shades and depth that one does not see in the tall world. The shot also illustrates the frame-by-frame painting technique and the unique look of the employed CGI, almost like a book’s coming to life. This ambitious project would not have taken shape were it not for the support of some of the largest media groups in the world. Since shortly after inception, many have shared Kring’s vision and ON’s powerful adaptation, including France 3 Cinema, Universal, and Gebeka, who will be in charge of the theatrical distribution in France. Their partnership has made the dream of bringing to life the magical garden a reality. It is one of the most ambitious projects of its kind originating in Europe in the past decade.